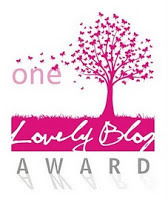 This entry was posted in Writing, Yeah Write and tagged Blogoversary, One Lovely Blog Award by Michigan Left. Bookmark the permalink. Kathleen, thank you so much! I am so happy to have found you through Yeah Write. Congrats on a year of blogging. I just love your blog and your talented writing self 🙂 Fall is my absolute favorite too. I love everything about it – the colors, the spicy smells, the cool air. When David and I got engaged, I didn’t care about anything else except that the wedding was in October that we use fall colors. You are so welcome. I adore you and your writing. A lovely award just suits you. P.S. I love fall weddings too. I bet yours was beautiful. Happy, happy bloggiversary!!! It’s so great to learn more about you through these factoids. Here’s to another great blogging year!!! Happy blogoversary!!!!!! I can’t believe it’s only been a year. Love your list. But when you go back to school– sit in the front. Haha! Thanks for the advice. Happy Blogoversary! I’m proud to have been one of your first followers. Keep up the good work. Thanks so much, Cynthia. You are a gem. I’m glad to know you. Thank you Kathleen! I haven’t been online much today and just saw your tweet. My blog just turned one too! I’m glad I found you too – yeah write peeps are awesome. You are very welcome. Happy blog birthday to you too, Stacie! Oh and I cry at those commercials too. Thanks so much for the honor. I am so glad our paths crossed through Yeah Write. Thank you for sharing your life and your amazing storytelling skills with us. I am proud of you too! You are the best, Robbie. You truly put the class in class act. Yay, congrats on both the award and the anniversary! I won my fifth grade spelling bee, too and also lost the school spelling bee! My word was quite. Thanks, Kianwi. What a funny coincidence about the spelling bees!